Hundreds of cats and dogs find homes! Guys, I am so excited!! The final numbers for cat and dog adoptions at PAWS for 2016 just came out! Over 300 dogs (337 to be exact!) and 512 cats found forever homes last year! I'm so proud to be a part of this wonderful organization! They do such a wonderful job placing the animals in the right homes so they don't get returned and have to be re-homed. They also have a fabulous fostering program which is so vital for so many pets especially ones who don't do well staying in a kennel. They have an awesome team of volunteers, who by the way recorded over 46,000 hours of volunteer hours to take care of these animals. I love photographing the cats and kittens of PAWS. I hope that my photos help our feline friends find a forever home faster so we can help even more homeless animals. Sometimes I feel overwhelmed going over on the weekends because I have so much work to do, but I always pack up my gear and make the effort. Not a single day have I regretted it. It's so rewarding spending an hour or two helping those who cannot speak for themselves. Knowing I got a good shot that reflects their best self that will hopefully attract that special person or family to bring them home forever makes it all worthwhile. Here are a few of my favorites from 2016. If you would like to volunteer at Centre County PAWS, visit their website HERE to get started! I promise you won't regret it! What do Ted Bundy, Albert DeSalvo (the “Boston Strangler”) and David Berkowitz (the “Son of Sam”) have in common (besides being serial killers)? Give up? They all admitted to torturing, abusing and killing animals when they were younger. Child and animal protection professionals have found that animal abuse is often a strong indicator of future violence. October is Domestic Violence Awareness Month. Centre County PAWS has teamed up with the Centre County Women’s Resource Center (CCWRC) to help raise awareness. The early warning signs of abuse isn't necessarily the first punch thrown, but the abuse of power and control over the family pet. To bring attention to this issue, the dogs and cats of PAWS are dressed up in purple bandanas for their profile photos the entire month of October. Not only do abusers beat, maim, threaten or harm animals, they use them for revenge or to psychologically control other family members. Well over half the women who seek shelter from domestic violence report animal abuse has occurred in the home as well. It’s not uncommon for women to stay in abusive relationships for the sake of their pets. Sometimes these furry family members are the only source of support and comfort during their darkest hours and they can’t bear to leave them behind. Victims of domestic violence will often admit their pet has been abused before they admit to their own suffering. And children who witness animal abuse are more likely to become abusers themselves. That’s why it’s important to report signs of animal abuse to the authorities. Stopping this vicious cycle early will prevent countless numbers of lives from being ruined. If you are a victim of domestic violence in central PA, please visit the CCWRC website HERE for more information on how they can help you. If you need a place to house your pet, please contact Centre County PAWS HERE. By becoming aware of the correlation between animal abuse and domestic violence, together we can end violence and sexual assault. To take the pledge, visit the “NO MORE” campaign website HERE. 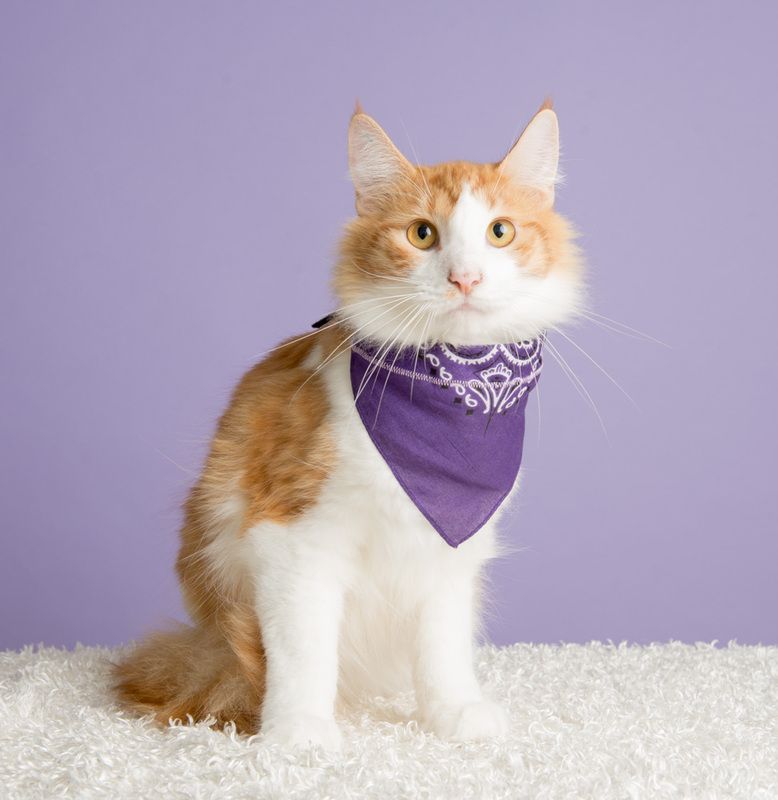 When the CCWRC asked if I would be willing to take photos of the cats and kittens wearing this purple bandana to show our support, I was more than happy to do so. I’ve been aware of this correlation for years and take it for granted that others are too. If this issue tugs at your heart like it does mine, please share this post. Let’s find homes for these cats and educate others at the same time! To show your support for this cause, you can also take a photo of your pet and share on your favorite social media platform. Tag your photos with #Peacefulhome4all.